English sergeant at law and politician; born in Jamaica Dec. 9, 1818; died in London June 24, 1897. He was descended on the maternal side from the Orobios (see Castro family). In 1833 he was sent to England to continue his education at a general school in Liverpool, and he studied Hebrew by himself with the view of becoming a rabbi, his object being to initiate a religious reform movement. His father, however, refused his consent to Simon's plans. Simon was graduated from the University of London in 1841; was called to the bar at the Middle Temple in 1842; and was the first Jew to practise at the common-law bar, Sir Francis Goldsmid, who had preceded him, practising at the chancery bar. Simon married in 1843 Rachel, fifth daughter of S. K. Salaman of London, and sister of the musical composer Charles Salaman. Later she was the author of "Records and Reflections." Simon spent the first two years of his married life in Jamaica, where he at once commenced to practise his profession in Spanish Town, then the seat of government. He left the island in 1845 because the climate injured his wife's health, and within a few years of their return to England he became a successful leader of the northern circuit, and soon won distinction in the superior courts in London. In 1858 he was second counsel in the state trial arising out of the Orsini conspiracy; and he successfully defended Dr. Bernard, who was charged with complicity in the attempted assassination of Napoleon III. In the same year Simon acted as assistant to the judges of county courts, thus being the first English Jew who exercised the functions of a judge. In 1864 he was created a serjeant at law (a legal and social rank known as the "Order of the Coif"), and he was one of the last survivors of this order. The degree of serjeant at law carried with it the dignity of a commissioner of assize; and in this capacity Simon again performed the functions of a judge. He repeatedly occupied the bench in Manchester and Liverpool, and presided at the City of London Court. In Jan., 1868, Simon received from the crown a patent of precedence granting him the additional rank of queen's counsel, an exceptional distinction. Simon was elected to Parliament in Nov., 1868, from the borough of Dewsbury in the West Riding of Yorkshire. He was reelected in 1874, 1880, 1885, and 1886, and sat continuously for twenty years, retiring in Nov., 1888, owing to failing health. 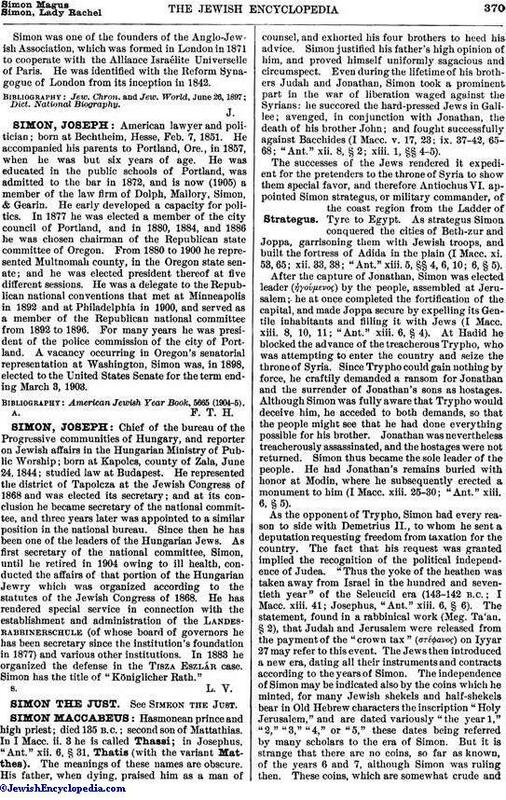 Although he had not a single Jewish elector in his constituency, he was regarded as the "Member for Jewry." In the House of Commons Simon exercised considerable influence with regard to the amendment of the judicature, the alteration of the law which regulated the trial of election petitions being due to his initiative. The resolution adopted Feb. 23, 1875, calling for the appointment of two judges instead of one to conduct such trials, was also the result of his activity. Simon was knighted in 1886. Before the British Parliament was open to Jews, Simon stood in the front rank of those who fought for their civil and political emancipation. That battle won, he availed himself of every opportunity to vindicate the cause of oppressed and persecuted Jews throughout the world. Again and again he caused blue books relating to the condition of the Jews in Rumania, Morocco, Russia, and Servia to be laid before Parliament; and after the death of Sir Francis Goldsmid, M.P. (1878), he became the recognized champion of his race before Parliament and the British public. When the knowledge reached England of the persecution of the Jews in Russia in 1881 and 1882 Simon conceived and carried into effect the idea of securing a protest from the entire English people. Within three weeks he had so aroused the feelings of the public men to whom he had personally submitted the issues, that a requisition, signed by the highest representatives in England, was presented to the lord mayor; and a meeting was convened on Feb. 1, 1882 (see Mansion House and Guildhall Meetings). The only Jewish speakers at this meeting were the present Lord Rothschild (then Sir Nathaniel de Rothschild, M.P.) and Sergeant Simon, who respectively moved and seconded the vote of thanks to the lord mayor. Similar meetings were convened in no less than forty-two cities and towns of England, Scotland, and Ireland under the presidency of the local mayors; and a protest from the University of Oxford, signed by the vice-chancellor, the heads of colleges, the leading professors, and hundreds of graduates, was addressed to the chief rabbi. In 1890, when the persecutions in Russia were renewed, Simon, who was then in somewhat failing health, took similar steps through the instrumentality of his son, Oswald John Simon (born 1855; educated at Balliol College, Oxford; member of the Russo-Jewish Committee and author of "World and Cloister" and "Faith and Experience"). In accordance with Sir John's plan a second requisition, signed by all the surviving signers of the first one, and by many others, was presented to the lord mayor, and a meeting was held at the Guildhall on Dec. 10, 1890, which was no less successful than the first one. 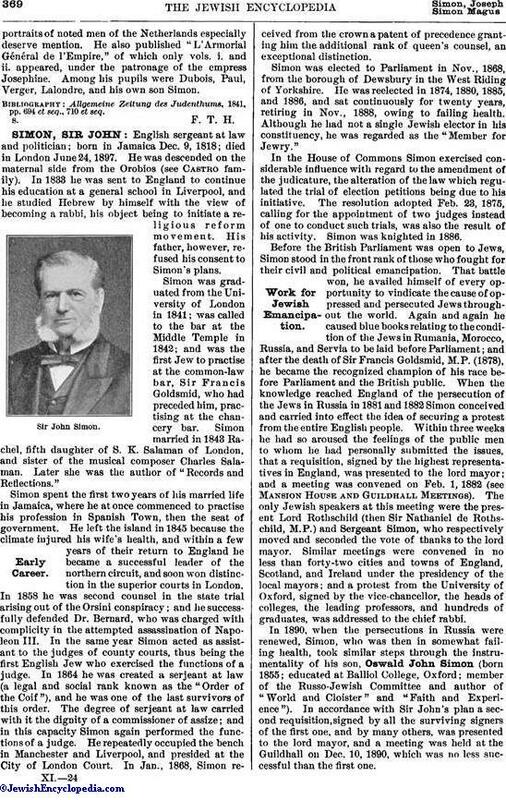 Simon was one of the founders of the Anglo-Jewish Association, which was formed in London in 1871 to cooperate with the Alliance Israélite Universelle of Paris. He was identified with the Reform Synagogue of London from its inception in 1842.